The Midnite Drive-In: Lucy (and Desi) on "Whats My Line?" 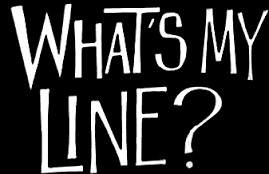 What's My Line? 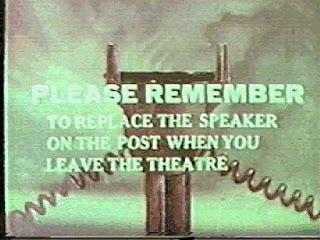 was a popular panel quiz show that ran, in its original form, from 1950-1967. The basic premise of the show was that 2 or 3 guests, all usually just your average "Joe (or Josephine) Blow", who had interesting occupations would appear on the show. It was the object or the four panelists to guess the occupation through a series of questions, which usually had to be able to be answered "yes" or "no". The sequence would be that one panelist would start the questioning, and get to ask questions until he or she received a "no" answer, and then the next panelist would get a go. And the game would end when either one panelist finally correctly guessed the occupation, or the panel had totaled up 10 "no" answers. The host/moderator was John Charles Daly. The panelists were a variety of well-known entertainers (well-known in the 50's... you can be forgiven if you say "who?" in the 2010's...), which included regulars Dorothy Kilgallen, Arlene Francis and Bennett Cerf, and some others who appeared with regularity over the years, like Steve Allen, Fred Allen and other "guest panelists". After the initial rounds of the show, the show would wrap up with a "mystery guest", some well-known figure, mostly in the entertainment business or a well-known sports figure. In this sequence, all the panelists would be blindfolded, and each panelist would get to ask one question in turn until the "mystery guest"'s identity was revealed. Most of the time,a mystery guest would make some effort to disguise his or her voice, leading, on many occasions, to cause the panelists to assume a male guest was female, or vice versa, to the hilarity of the studio audience, who of course were in on the real identity. I used to make a point of being home on Sunday nights back in the early 2000's, because Game Show Network would re-broadcast old episodes of this and several other classic game shows from the 50's and 60's. I was a 2 hour segment they called "GSN in Black & White", and they showed "What's My Line", "I've Got A Secret", "The Name's the Same" and several other classics from the era. I dearly miss watching those. 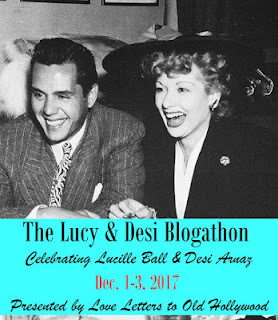 Lucille Ball (with/or without Desi Arnaz) was a "mystery guest" on the original series a total of 6 times. Lucy's first appearance on the show as a mystery guest. She does a wonderful job, answering all the panelists questions in a squeaky voice, speaking a foreign language which John Charles Daly says is "Martian". I should note that the above introduction, which states that each panelist got to ask only one question in turn had not been established yet in this episode, so only three of the four panelists got to ask any questions before the mystery guest's identity was revealed. Lucy appears in conjunction with a current movie release, which is not mentioned by name, but I imagine was "The Long, Long Trailer". Panelists were: Dorothy Kilgallen, Steve Allen, Anne Francis and Deborah Kerr (who was the only one who missed out on getting to ask any questions). Lucy appeared on this episode with Desi, to the consternation of the entire panel. Desi would alternate with Lucy in answering the questions by the panelists; Desi with a high squeaky "uh-huh" of "unh-hunh", as the question warranted, and with Lucy answering some questions with a husky voice. The panel was convinced that only one person was on stage with Daly. Robert Q. Lewis is hilarious as he keeps asking over and over again whether or not the panel might have seen them on TV earlier that day (or night, as he is probably referring to the TV series "I Love Lucy".) They are appearing in promotion of the new TV season. Panelists for this episode were: Dorothy Kilgallen, Robert Q Lewis, Arlene Francis and Bennett Cerf. BTW, my opinion is this is the best of the 6 appearances. Lucy appears on this episode because she was at that time, currently appearing in a Broadway play called Wildcats. Lucy does, as before in the previous appearances, attempt to disguise her voice, but I feel certain if I were blindfolded, and didn't even know she was in town, I would have recognized who she was, right away. This is borne out by the panelists who seem to know who she is almost from the first answer. Panelists for this one were: Arlene Francis, Shelley Berman, Faye Emerson and Bennett Cerf. Lucy appears on this show, apparently because the "I Love Lucy" show was changing times, but also because she happened to be in town to appear on the "Tonight Show" when Steve Allen was host.. She hilariously uses a rather sneezy voice (you have to watch to get that, that's the best I can describe it). One panelist queries, quite reasonably, if there is more than one guest on stage. Panelists for this episode: Mike Douglas, Arlene Francis, Bennett Cerf and Dorothy Kilgallen. A miss the days of What's My Line? I may nostalgically start calling you Mister Quiggy and you can call me Miss Caftan. Youtube has whole episodes, but what I wouldn't give for a vast collection of those panel shows on DVD. Especially Whats My Line ans The Name's the Same. Thanks for reading. Great post! I wish GSN still played these old game shows. They can be pretty fun to watch, especially when you have someone like Lucy appearing on them. Thanks for bringing such a unique topic to my blogathon! The great thing is youtube has whole episodes but it's not a complete list. If you can buy the Donna Reed Show and Father knows Best on DVD, you should be able to buy those old game shows somewhere... Thanks for reading. These are adorable! I've seen the older ones before but not the ones from the 1960s. Look how pretty and fashionable our girl Lucy is! And I adore John Daly's voice. Bennett Cerf is a pleasant person too. Thanks for reading. I would like to see those. And "The Name's the Same", two of my favorites from GSN's Sunday night theme of "GSN in B & W". Thanks for reading.